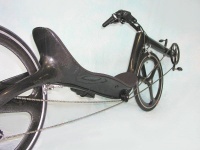 The weight of a complete Carbon Low Racer is around 8,5 REAL kilogrammes. The M5 Low Racer is no longer just the fastest bike in the world, it's also the lightest productionbike too. This is made possible by applying the most innovative techniques on the field of synthetic materials. For example: the special carbonmade partitions inside the frame. To set the bike on the right lenght for the legs, the telescopic bracketpiece is glued in the main frame. The exchangeable rear drop-outs are made of aluminum. The carbon monoblade front fork only weighs 350 grammes. A special carbon front piece + handle bar is applied with a weight of just 150 grammes! Carbon handle bar (+/- 125 grammes) with the 'Whale Tail' brake lever. The Whale Tail weighs 18 grammes.